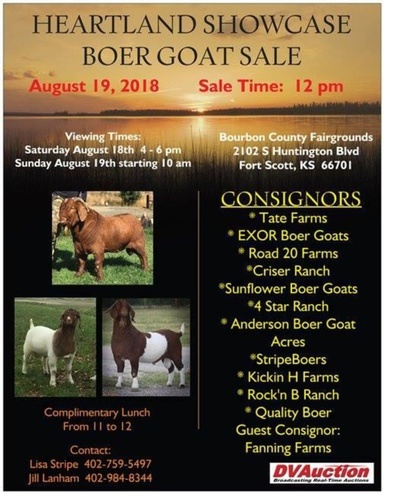 Heartland Showcase Boer Goat Sale August 19th at 12pm. There will be viewing times for Saturday, August 18th at 4-6pm and Sunday, August 19th starting at 10am. 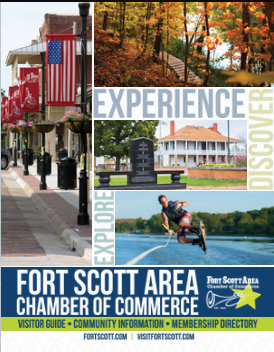 This will be at the Bourbon Co. Fairgrounds on 2102 S. Huntington Blvd in Fort Scott. Consignors: Tate Farms, EXOR Boer Goats, Road 20 Farms, Criser Ranch, Sunflower Boer Goats, 4 Star Ranch, Anderson Boer Goat Acres, StripeBoers, Kickin H Farms, Rock'n B Ranch and guest consignor is Fanning Farms. There will be a complimentary lunch from 11-12. You may contact Lisa Stripe at 402-759-5497 or Jill Lanham at 402-984-8344.